Dinner at the lovely Rebelle, on the Bowery, with Vanessa way back. We’d tried to eat at another restaurant in the East Village but the wait was too long and we were famished for some good food and wine. 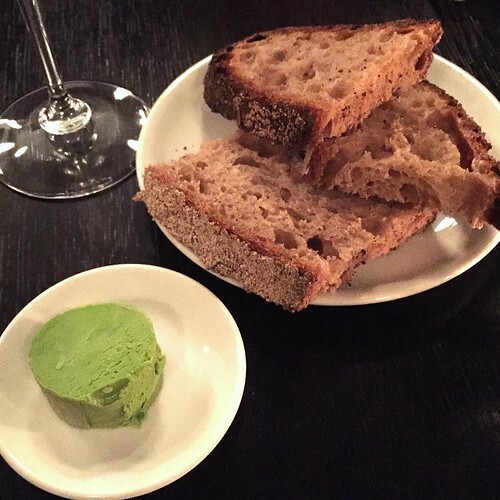 Upon arriving, we were seated immediately and dug right into some crusty miche with ramp butter, raw oysters with a punchy mignonette and a glass of nice, crisp champagne. Bread, butter and oysters…a great meal in itself. But, per usual, we didn’t stop there and ended up ordering a slew of other dishes, including the beef tartare; white asparagus and seared scallops. 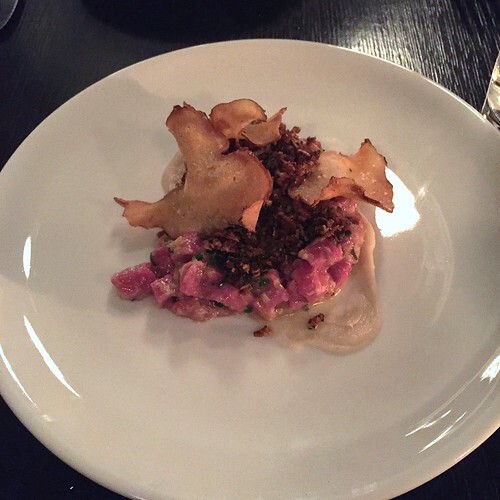 The beef tartare was a wonderful mix of textures – chewy, high-quality beef with a smooth sunchoke cream, spicy, pungent kick from the horseradish and garlic combination and salty crunch from sliced fried sunchokes. 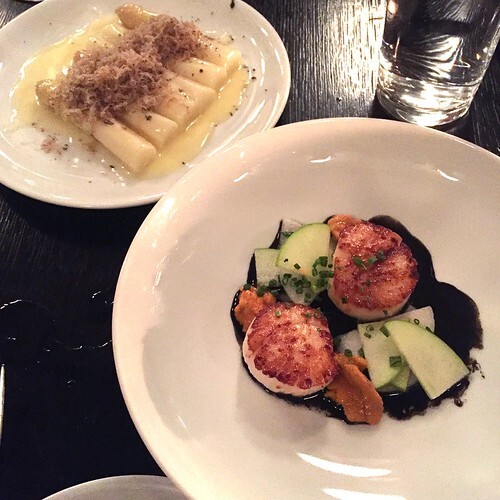 The seasonal white asparagus with beurre blanc and summer truffle appeared rather simple but was a highly finessed, earthy dish and the scallops with uni, turnip and squid ink balanced marine briny-ness with a pop of sweet apple. 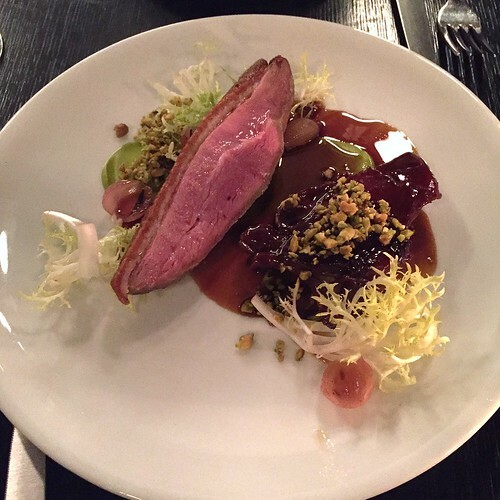 Finally, even after all that, we were still hungry and decided to share a main course of roast duck with frisee, pistachio and pickled pearl onions. It was cooked to pink perfection with crispy skin (and just the right amount of fat left) with a delicious glaze and crunch from the nuts. The service and ambience were also all-around good, so will definitely try to come back some time, especially during the winter when the menu has changed and I’m craving a fat glass of red wine and even richer, heartier dishes. Same neighborhood, different restaurant – Bowery Meat Company for an impromptu dinner as a break from work. 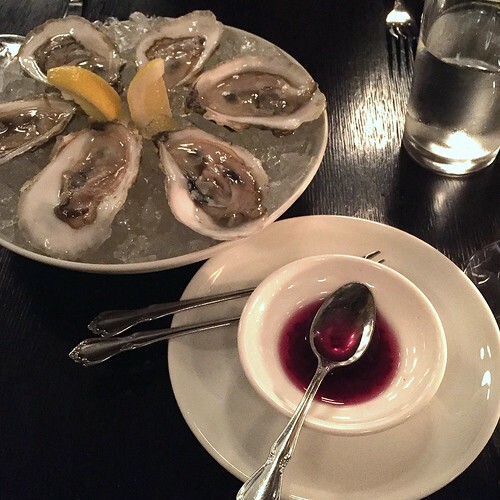 Given how giant and rich portions were during my first visit, we decided to stick with oysters (raw and broiled) to start as opposed to any of the other appetizers and then our separate mains. 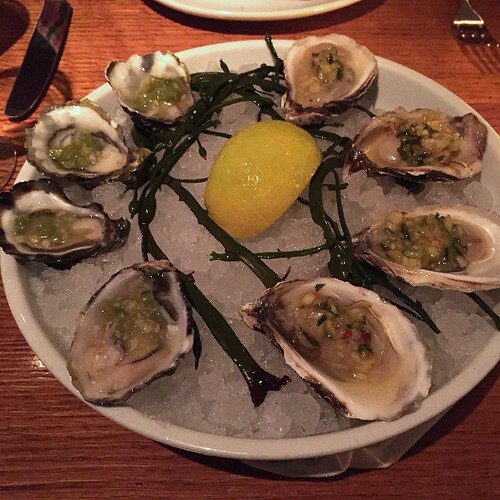 Our beau soleil oysters came with pineapple cucumber salsa and the kumamotos with wasabi leaf and lemon. Refreshing and perfect for the summer. 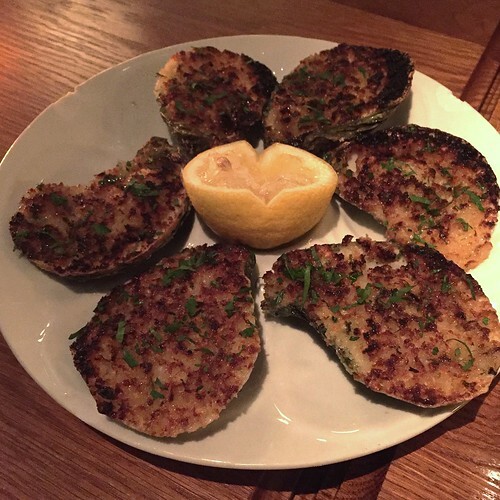 The broiled oysters with garlic, romano cheese, bread crumbs and parsley were a totally different take and though I usually prefer my oysters raw, these were so cheesy and indulgent that I kind of forgot about the beau soleils and kumamotos. 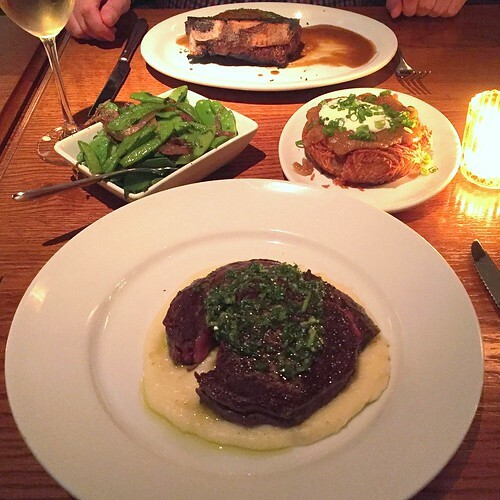 For our mains, I ordered the Bowery steak with salsa verde and whipped potato – a nice medium-rare with crusty char and a offset by the herbaceous salsa and Chris got the bone-in filet mignon au poivre. Sides were the memorable sour cream and onion hash brown we got during our first visit and then spring peas because, you know, green. A nice, quiet meal right before my summer got insanely busy, at a restaurant that’s normally quite packed, noisy and to be honest, too scene-y for my taste. You are currently reading Rebelle and Bowery Meat Company at Notes on Food.